Title: The New Testament, translated from the Greek: and the Four Gospels arranged, in Harmony, where the parts of each are introduced according to the natural order of the narrative and the exact order of time. With Some Preliminary Observations; and Notes Critical and Explanatory. 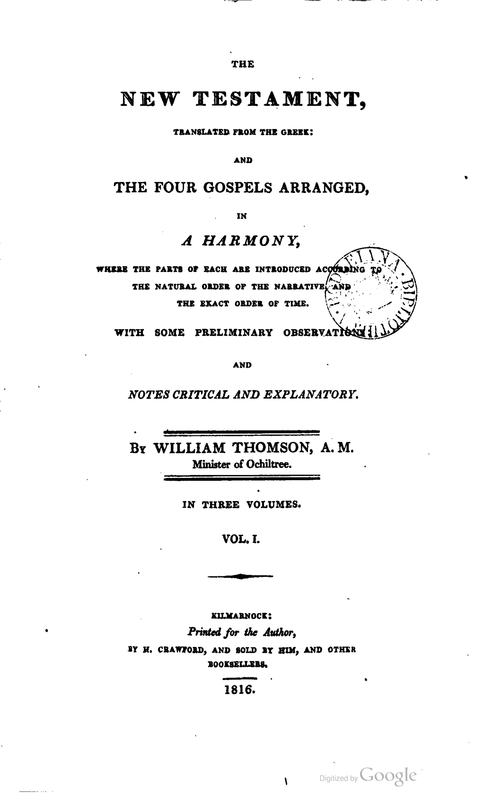 By William Thomson, A.M. Minister of Ochiltree. In Three Volumes. References: Chamberlin 544-1, Taliaferro CN00203. Images: Volume 1 Title page (from the online facsimile). Facsimile A pdf facsimile of Volume 1 is available at books.google.com.